On Friday I participated in Metropolis at Metrotown’s Black Friday Blogger Challenge, on behalf of Modern Mix Vancouver (#BlackFridayBC). Three other fashion and lifestyle bloggers were invited to compete too: Coco & Vera, Just J and Style Calling. Rather than recap my recap that I wrote on the MMV website, here’s a quick run down of my experience on the day of. For a full event recap, check out my article on Modern Mix Vancouver. Since this was my first time doing the Black Friday Blogger Challenge, I didn’t really know what to expect only that I was going to be given a $100 Metropolis gift card, and in 90 minutes I had to put together an outfit based on style/completeness of outfit, ability to get a great deal, and number of retailers visited. Sounds simple, right? Potential item from AE where everything was 40% off! Frantically running around the mall! More adventures during the Black Friday Blogger Challenge! 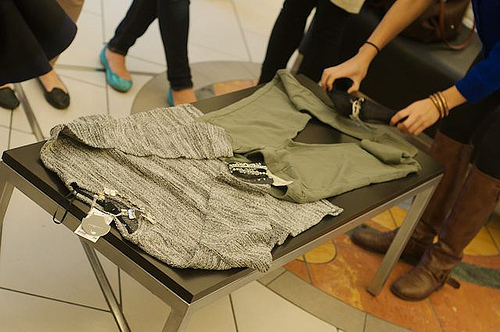 Which sweater to choose from H&M? Both were 50% off! Challenge winner Cee’s (Coco & Vera) outfit! We LOVE shopping for great deals! My Black Friday Blogger challenge outfit! With $20 to spare! Though I did think about potential outfit ideas, I had no real strategy going into the challenge (way to go eudorable..). I was literally running around the mall trying to figure out what would fulfil the criteria, as well as what would represent my own individual style. I’m happy to say that at the end of the 90 minutes, I managed to finish the challenge with a complete outfit, but ran out of time towards the end and had $20 left….boourns! Still pretty happy that I put together a complete and accessorized $80 outfit that I am SO looking forward to wearing! I may not have been the winner, but I’d do this challenge again in a heartbeat! I’m so fortunate to have been a participant this year, and it was one of the most fun and exciting fashion-related events I’ve been a part of. 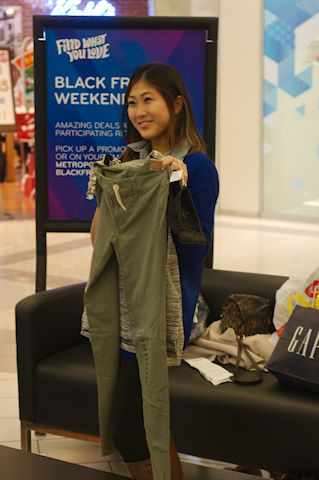 Thanks to Vanessa and the rest of the Metropolis at Metrotown team for inviting me to this Black Friday Blogger Challenge that epitomized affordable fashion and style, things I can relate to and appreciate. And a shout out to the three other fashion and lifestyle bloggers who also participated (Coco & Vera, Just J and Style Calling)- they all did a fabulous styling job! Find out how you can be entered to win a $50 Metropolis at Metrotown gift card by reading my article on Modern Mix Vancouver.